After producing a number of DVDs on world renowned speedway riders, Tony McDonald from Retro-Speedway has gone back to his roots for this latest video. He's opted to tell the tale of the Rayleigh Rockets in the period 1968 to 1973. This period saw the Rockets become founding members of the British League Second Division and entertain thousands at the Weir Stadium until its eventual closure. The story is told by a combination of narration, interview and images - both moving and still. McDonald is the narrator and shares personal memories alongside all the relevant facts and figures for the period. He's clearly not dispassionate about the club and this is evident throughout, one suspects this DVD is a labour of love as much (or perhaps more) a profit making exercise. Vibrant colour cine film is used to show the Rockets in action both home and away. Although the action footage has the old limitation of mainly showing the racing on just one bend, it does give a flavour of what watching speedway at Rayleigh must have been like. The DVD really comes into its own with the interviews with former Rayleigh favourites. Former promoter Peter Thorogood explains how he fell into the job almost accidentally, Terry Stone speaks passionately about the club and gravel voiced Tiger Beech recalls his days as the track heartthrob. Dingle Brown, Laurie Etheridge and Graeme Smith are amongst the others sharing their views and recollections. The film is illustrated throughout with a fine selection of colour and black and white pictures. Most of these will not have been seen for many a year and are sure to bring back many happy memories. Split over two DVDs, the film lasts over three hours, the first DVD concentrating mainly on 1968 to 1970 and the second the final years at the Weir. 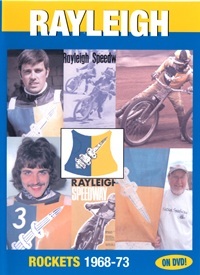 The first DVD ends with a montage of track souvenirs, programme covers and other memorabilia. The second with a gallery of former Rockets riders - many falling into the 'unsung hero' category. Although this DVD will obviously be of greatest interest to Rockets' fans, there's enough in here to keep any fan of 70s speedway entertained. It's just a pity that every club can't have their history preserved in such a form. Hopefully this will be the first of many such productions from the crew at Retro-Speedway.